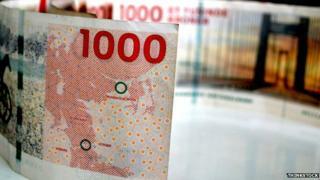 Image caption Denmark has been tying its currency, the krone, to the euro. There have been two important, connected economic developments in Europe. There is a debate to be had about whether deflation really is a problem and if so how serious, but the ECB clearly thinks it is. The steps it has taken to address low inflation, and then deflation, have made it harder for financial market investors to make money in the eurozone. The ECB cut interest rates and last week launched its quantitative easing programme, which also tends to reduce returns on financial assets. So investors piled into other currencies, including the krone, pushing it higher, though not so high that it has gone above the top of the central bank's target band. The Danish central bank's rate cuts are intended to offset that pressure. Does it sound familiar? The Swiss central bank recently gave up its attempt to cap the value of the franc and allowed it to rise. It would be a bigger loss of credibility for Denmark to do the same, because the peg to the euro has been the central element of its economic policy for so long. In addition, Denmark is a smaller financial system and it is not an established magnet for internationally mobile money in the way that Switzerland is. Those are reasons why the Danish currency peg may survive. But the attempt to preserve it has already taken the Danish National Bank into some unusual territory. Where next for the eurozone after the Greek vote?